Mumbai: Financial stress at the top 10 Indian conglomerates has intensified even as some of them cut back on capital expenditure and attempted to sell assets to pare debt, according to a new report on Wednesday by Credit Suisse Group AG. Titled House of Debt, the report is an update of its first report on this topic in 2012 that listed the 10 most indebted corporate houses in India. 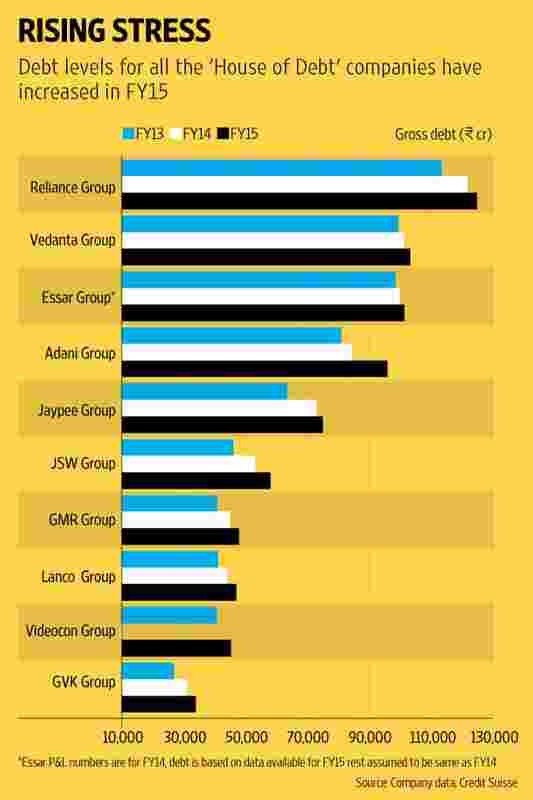 The top 10 are Lanco Group, Jaypee Group, GMR Group, Videocon Group, GVK Group, Essar Group, Adani Group, Reliance Group, JSW Group and Vedanta Group. The debt at these groups has risen seven times over the past eight years, Credit Suisse said. Their loans add up to 12% of the loans in the banking system in India and 27% of corporate loans. Their interest cover dropped to 0.8 in 2014-15 from 0.9 in 20113-14 and debt-to-Ebitda (earnings before interest, tax, depreciation and amortization) multiple rose to 7 from 6.8. The interest coverage ratio is a yardstick of how easily firms can service their debt while the debt-to-Ebitda ratio refers to how many years it would take for a company to pay back its debt if net debt and Ebitda are held constant. A high debt-to-Ebitda multiple suggests that a company may not be able to service debt and when a firm’s interest coverage ratio is 1.5 or lower, it may be unable to meet interest expenses. An economic downturn in recent years, coupled with delays in securing government approvals, completing land acquisition and procuring fuel supplies have stalled many infrastructure projects such as roads and power plants, hurting corporate cash flows and impairing their ability to repay debt. 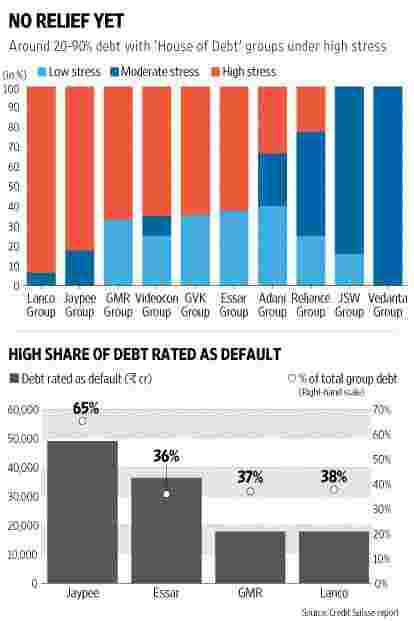 For four of the 10 groups, Jaypee, Lanco, Essar, and GMR, Credit Suisse said 40-65% of group debt has already been downgraded to default (D rating) by credit assessors. Earlier this year Mint chronicled the troubles at some of these companies that had default events. There have been instances of visible default (by Jaypee Group on foreign currency convertible bonds) and cases of some banks classifying loans as non performing loans or NPAs (in the case of Essar Steel and GVK coal mines acquisition debt), the Credit Suisse report noted. “Auditor reports have also highlighted eight instances of delays in payments on $16 billion of loans (15% of the 10 groups’ debt) overdue of more than 90 days," the report said. Essar’s debt should not be seen in isolation of its assets, capacities and a significant equity contribution of ₹ 75,000 crore to its businesses, an Essar spokesperson said. “With most of our projects completed and going into operation, the companies have significant earning potential which will reflect in the profitability shortly," he said. At a group level, Essar’s Ebitda for the year ended 31 March was about ₹ 15,000 crore and erroneously mentioned as ₹ 8,370 crore in the Credit Suisse report, the spokesperson said. “There is no increase in term debt of the companies. Further, significant de-leveraging will take place in the near future with the monetization transactions currently envisaged," the spokesperson added. Jaypee Group, JSW Group, Reliance Group and GVK Group did not reply to calls and text messages seeking comments to the story. A senior executive from one of the 10 groups said the Credit Suisse report was sensationalizing the debt problem. “There is no great discovery in the report. There is no need for any special intelligence to find out that the debt levels are increasing as there was no coal, gas or land available to generate cash for infrastructure and power projects," this person said on condition of anonymity. The person attributed the troubles of the groups to issues related to delays in land acquisition and environmental clearances, and the non-availability of fuel. He said the Credit Suisse report had ignored the fact that some stalled projects of the 10 groups have started generating cash, improving debt quality. “Infrastructure companies cannot wish away debt." he said. According to the report, Adani Group (debt up 14% year-on-year) and Videocon Group (debt up 11%) have seen the largest increases in debt levels since last year. The report cautioned that the Adani Group’s debt increase has been on account of its acquisitions and is likely to rise in 2015-16 as it consummates a few other acquisitions currently in the works. An Adani spokesperson declined to comment. The first six months of financial year 2015-2016 saw debt worth ₹ 2.4 trillion being downgraded, rating agency Crisil Ltd said on 6 October. Of this, 90% is owed by firms from either companies in capital-intensive sectors or commodity sectors. “....firms in the metals, real estate and infrastructure space continue to face pressure because of high debt or a steep fall in product prices," the rating agency said. Most of those downgrades were of firms that already had high levels of debt. Credit quality pressures have intensified for highly leveraged firms—those with a debt-to-Ebitda ratio of more than 2.5 times. The Credit Suisse report noted that even as some groups cut back on capital expenditure (Capex) and looked to sell assets (this includes the Jaypee Group and GMR Group), their debt-to-Ebitda multiple has only increased as relatively better assets (contributing as much as 70% of Ebitda) were sold. For instance, so far in 2015, Jaypee Group has completed the sale of its two hydro power assets to JSW Energy Ltd for a deal value of ₹ 9,200 crore. Videocon hasn’t seen any reduction in debt levels even after the sale of its 10% stake in the Mozambique oil asset for $2.4 billion. “In groups such as GMR and Videocon the absolute level of debt has continued to rise despite the asset sales on account of ongoing capex and operational losses. Debt levels have continued to rise even as groups have significantly cut back on capex (20-70%) due to a lack of funds. Lanco has seen negligible capex over the past two years even with 57% of its total planned power capacity still under construction," the report said. The report said the increase in debt has outpaced the rise in capex by a margin of between 120% and 195%. “Many of their projects now have 20-70% cost overruns pushing their capital costs even above replacement costs. With a significant (30-60%) capacity still under construction, a large (15-170% of profit and loss interest) is still being capitalised," the report noted. According to the report, Adani Group had gross debt of ₹ 96,031 crore in 2015-15, Essar Group ₹ 1.01 trillion, GMR Group ₹ 47,976 crore, GVK Group ₹ 33,933 crore, Jaypee Group ₹ 75,163 crore, JSW Group ₹ 58,171 crore, Lanco Group ₹ 47,102 crore, Reliance Group ₹ 1.25 trillion, Vedanta Group ₹ 1.03 trillion and Videocon Group ₹ 45,405 crore. The Credit Suisse update also pointed out the increasing risk for lenders focused on corporate entities. Corporate banks are already trading at multiples that are at a discount to the consumer lenders on account of the large reported differential in their asset quality trends over the past three years. “However, debt for these groups is still “standard" in books of the banks, The rising intensity of stress for these borrowers and downgrades from rating agencies, increases the possibilities of these slipping to NPLs (non-performing loans). The share of stressed loans with these groups is equivalent to 4.5% of system loans (equivalent to 100% of current reported Gross NPAs, or non-performing assets). Including this, total system impaired loans would be at 17% of system loans," the report said. As the pace of non-performing asset (NPA) recognition accelerates, it will pose a risk to management’s guidance and market expectations of impaired asset formation over the next 12-18 months, it said. “We remain cautious on corporate lenders, in particular the state-owned banks, as they are under-provisioned and undercapitalised," it noted. Loan approvals to potentially stressed companies have risen 85% since 2011-12 as banks continued to lend to such borrowers despite deteriorating cash flows and increased debt on their balance sheets, UBS AG said in a report in July. The report was based on a proprietary survey conducted by UBS pertaining to a sample of around 100 potentially stressed companies, covering some $100 billion of loans. Over 7,000 collateral documents filed at the Registrar of Companies that are used to secure loans were analysed for the survey, UBS said.